Congratulations to the 2019 Dr. Ivan Goldberg Award Recipient! Dr. Hellerstein is a respected researcher and clinician. In addition to his many scientific articles on the psychopharmacology of depression, he is also the author of several non-medical books including his biographical novel, “A Family of Doctors,” as well as his book, “Battles of Life and Death: The Discoveries of a Young Doctor During His Medical Education.” In the spirit of Dr. Goldberg, Dr. Hellerstein has used the internet to disseminate psychiatric knowledge as well as caution us to the complexities that come with such technological advancement. Dr. Hellerstein is the Editor-in-Chief of Columbia University’s Department of Psychiatry’s website. Dr. Hellerstein is also a dedicated teacher and educator. He has taught medical students and psychiatry residents for over 3 decades. He also teaches and informs the general public through his writings. He is the medical director of the NY branch of the Mood Disorders Support Group, a patient-run organization to help those with mood disorders. 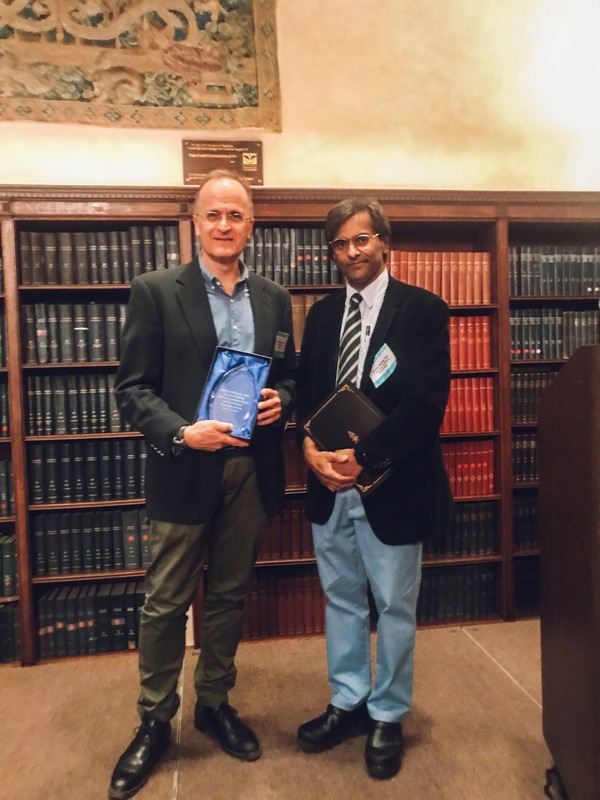 In giving this award, the NYCPS recognizes Dr. Hellerstein’s commitment to scientific psychiatric knowledge, and how such knowledge may be translated to relieve human suffering from psychiatric illness. The New York County Psychiatric Society invites its members to nominate potential candidates for the Dr. Ivan Goldberg Outstanding Service Award. This award, given by the New York County Psychiatric Society, commemorates the unique and novel contributions made by the late Dr. Goldberg to the field of psychiatry. Dr. Goldberg was the consummate New York City psychiatrist; an expert psychopharmacologist, and a psychotherapist in private practice, who held various academic appointments and was the medical director of the New York City Mood Disorders Support Group. He was a pioneer in disseminating psychiatric knowledge to mental health professionals and to the lay public. He established an encyclopedic website, Depression Central, as well as several renowned psychiatry listservs, which continue to educate mental health professionals worldwide today. Nominees should demonstrate the pioneering spirit of Dr. Goldberg’s work; to make psychiatric knowledge accessible to all. We welcome candidates from all backgrounds, who work in any type of setting, clinical or non-clinical, and whether or not they are affiliated with any academic institution. The ideal candidate will be someone who has found innovative ways to treat and educate others about psychiatry. We define this as broadly as possible to include those with expertise in neuroscience, to those with expertise in psychotherapy. A nominee may be someone who is using the latest technological advances in teaching psychiatry to future physicians, or someone who began a grassroots movement that is changing how society perceives mental illness, or someone working to change the public perception of psychiatry. Nominees must be a current General Member, Fellow, Distinguished Fellow, or Life Fellow of the APA from one of the New York City District Branches, including the New York County Psychiatric Society, the Bronx District Branch, the Brooklyn Psychiatric Society, or the Queens Psychiatric Society. Candidates for the award may be self-nominated or nominated by a member of the New York County Psychiatric Society. Please send us the full name, contact information, and current resume or curriculum vitae of the nominee. Also, please include your name, contact information, and a brief statement, of one page or less, explaining why you think the person you are nominating would be suitable for this award. All submission materials and questions should be emailed to [email protected] with Ivan Goldberg Award in the subject line. To download this information, including the instructions, please click here.